I decided to start a thread to document all the modifications we're making to Copacetic's trailer in hopes some of you might find something of use here. We solved our initial weight distribution issues by getting the boat back on the cradle properly and then unbolting the cradle, sliding it forward on the trailer and bolting it back down. We then repositioned, and extended our winch upright and installed a winch and large bow roller. She won't slide back again unless we want her to. I didn't like tieing the mast to the pulpit and pushpit, and also wanted to bear the weight inboard rather than out at the tip of the pulpit. 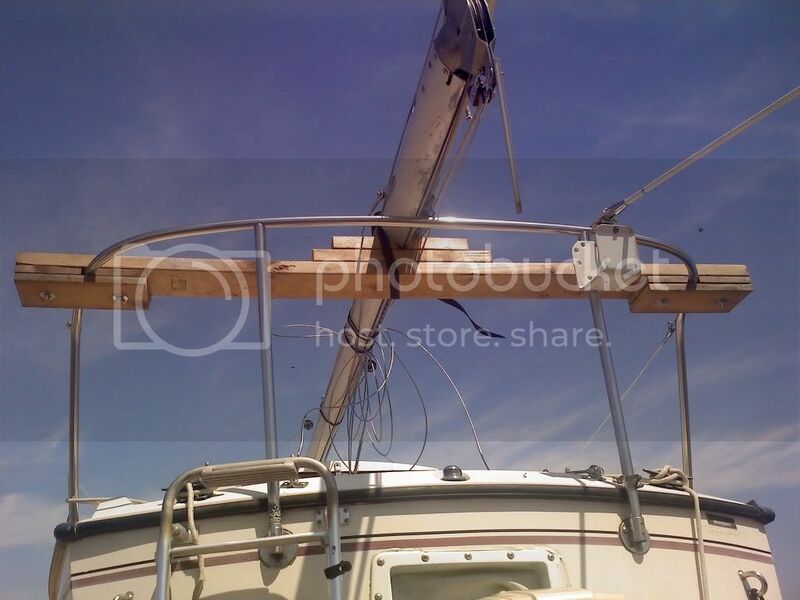 I built mast carriers that clamp securely on and use cinch straps to hold the mast firmly. After using them, I'm planning to add a roller on the stern (pictured here) to make setup and tear down easier. When we launched the first time, we didn't realize that two of our six pads were not attached. With Copacetic no longer holding them on, they made a bid for freedom and dove for the bottom, never to be seen again. Now with only four pads holding the boat the hull started to bow in a bit. Our trailer doesn't have a keelboard (yet) so the full weight is carried by the pads. 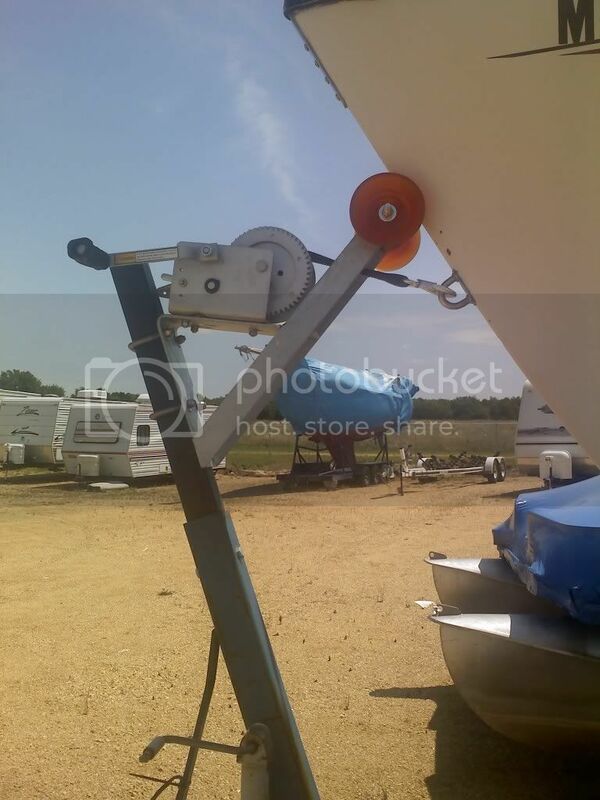 Since the trailer had eight uprights for pads I purchased eight sailboat stand tops. I had adapters made to fit the stand tops to the square tubes of the trailer. In the pictures you can see the tops of the black adapters just under the Hostar "wing nuts". I modified the stand tops by adding a second layer of 3/4" plywood and carpet. I also drilled and tapped the wing nuts and added set screws to avoid having them loose adjustment due to vibration. 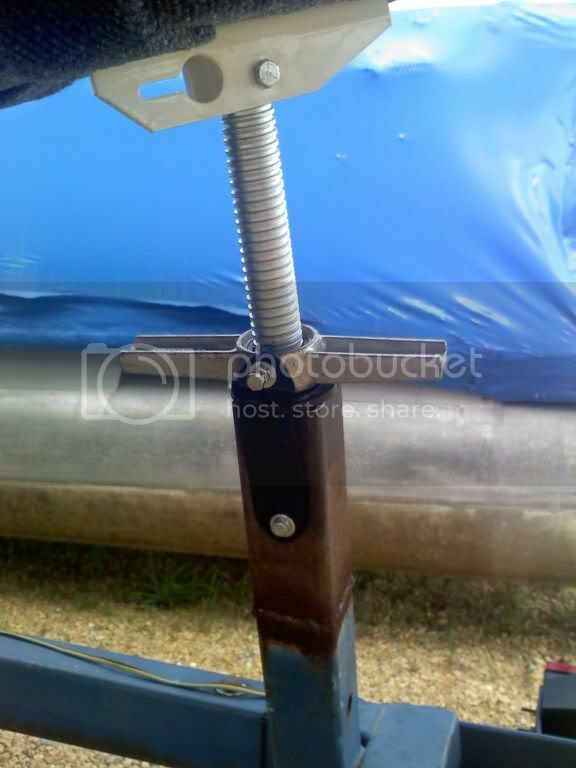 Those set screws now do double duty by also holding the top of sheet metal retention straps to help the tops stay put when the boat is off. We managed to get six pads on before the cordless power tools ran out of juice so we'll go back tonight and finish up the last two. Now the trailer just needs a coat of paint, new tires, brake pads... Eventually I'll get to spend my time working on the boat! Last edited by tgentry on Fri Jul 17, 2009 12:13 pm, edited 2 times in total. WOW! Great timing.... after a many years and many several thousands of boatyard fees later, I think I may have found a trailer...so you no longer will hear me whine about the trailer and now I will join the "modify the trailer" threads... anyway, I was torn between the "cradle on the trailer" solution vs. the build a real sailboat trailer solution. My OEM Chrysler factory shipping cradle is wood timbers -- rock solid mind you but not really for mounting on a landscape trailer or car carrier...So.... I am pretty sure i purchased ( waiting ot hear if offer accepted) a slightly used sailboat trailer and modify her for the c-26 fixed keel. OR, I could use pads or bunks... I am very interested in the source and cost of the "screw pads" you have used , they look great. Since I will have to modify my trailer too.... I think that adjustment is just what I will need... How much weight do you have on the tounge? 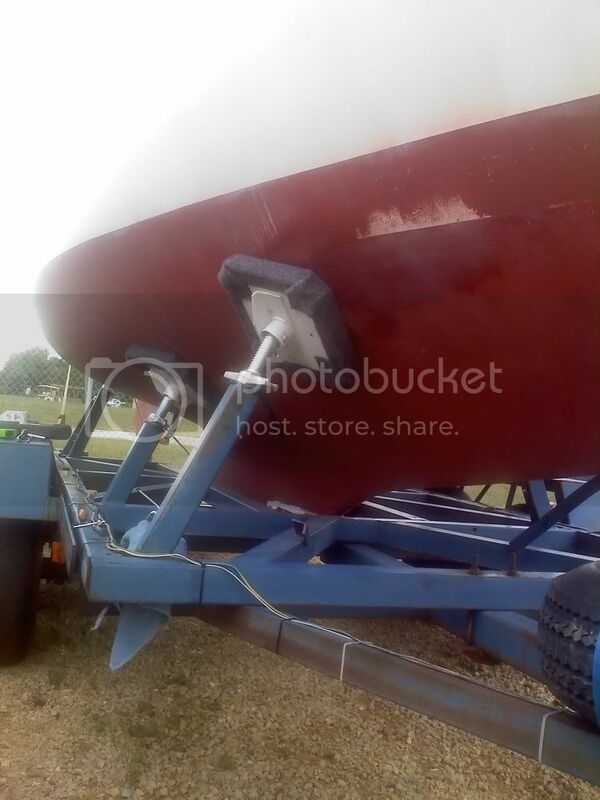 My trailer will be "painted steel" it is unlikely to get wet ( see above) but what is the best paint to be used for a steel sailboat trailer to avoid rust and get long life..
apologies for hijack.. backto a great trailer mod thread.. I was told that my steel cradle is the original for my '79 boat. It might be hard to tell in the pictures, but my trailer was custom built of angle iron and mobile home axles with the steel cradle bolted on. I currently have about 450 pounds on the tongue. Still a bit light, but it's the best I can do without moving the axles back which would take a lot of cutting and welding. 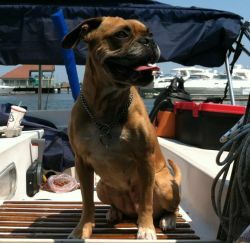 I got my sailboat stand tops from Hostar Marine (www.hostarmarine.com). I thought the cost was reasonable at $35 each. Hostar mentioned that many people use them on trailers, but for the trailers they build they put a second layer of 3/4" plywood on, so that's what I did. For trailer paint, in the past I've always used exterior gloss enamel and it seems to hold up just fine. My swing keel 26 needs about 4.5 feet of water to float off the trailer. Keep in mind that your keel will be elevated above the ground, so you'll need more than the boat's draft. The axles are usually the limiting factor for how low you can get the boat. I thought about attaching my axles to the top, rather then the bottom, of the springs. That would lower the whole rig about 6", but unfortunately it would bring the axles dangerously close to my keel. 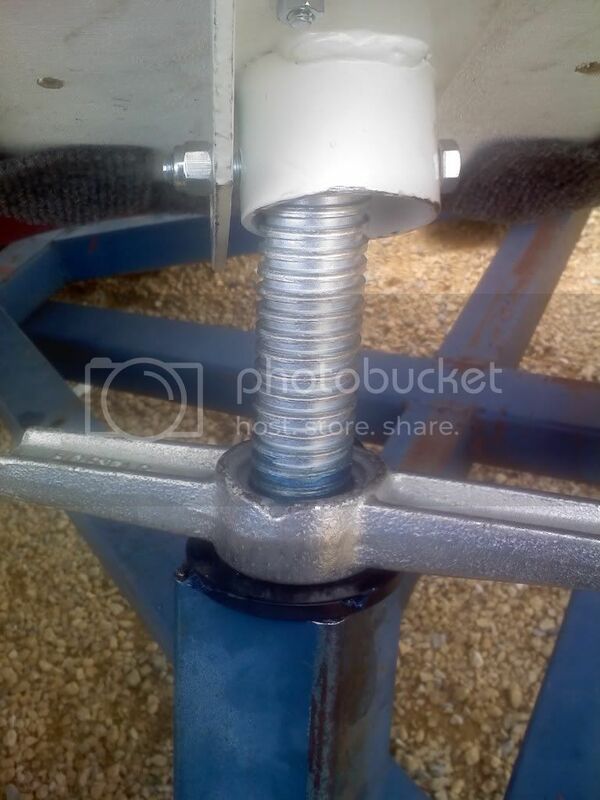 Drop axles are another alternative and generally will lower your trailer about 4". I had the wrong pic in, there is now one showing the set screw and retention strap. The trailer is now finished with carpet from the parts boat. I just need to come up with a way to get from cradle to trailer. At first I was thinking I wanted a wet slip but I can buy a nice tow vehical for the cost of a slip for the year. I would like to lake/ costal hop. Only problem is I don't have the stock boom so I don't have the set up for steping the mast myself. You've built a beautiful trailer there. One thing I noticed - you only have the winch on the front. The "best practice" for trailering is to have an additional fixed cable or rope with a hook to hold the front so that you are not relying on the winch. Both of the power boat rigs I had came that way. Maybe its like having a belt and suspenders but better than having it slide off the back on a steep hill. I keep it as low as possible in hope to be able to lunch from it.. it has tip option. A chain is on the to-do list. For anyone wondering, we also have a breakaway kit ready to install, high up the winch post to keep it clear of water. Ok, it looks like I finally got a trailer after a 2-1/2 year search. I think I overpaid -- about double what I wanted to pay ( a real good deal not far from me disappeared in a literal foot race with someone else gettign there with the deposit before me ( I was father away) even though I was the first to see the adv and the first to call the seller -- oh well) the trailer is near jacksoneville, Fl. and I am in NYC... hmmm... should have thought this through a little better , but I was getting anxious. The good news is I won't be wasting space here with me whining about boat yard bills and looking for a trailer AND it seems that the trailer will need no or very little mods for my c-26. Well, can't wait to get the trailer north and the boat on it this winter and start the first winter on boatyard savings... now if I can figure out how to load or launch her from the trailer that would be complete.... I see that the youtube video of getting the trailer OUT of the water with a real long tow rope...but how would you ever get the trailer all the way out there int he first place... I will need at least 4 feet plus the height of the trailer !!! that is a lot of water for a ramp... my guess is I would need some serious tires on the trailer and the tounge in order sotaht the trailer/boat do not get bogged down in the muck. NYC, I see a tongue extension in your future ! PartyDog is down Jacksonville way, I think ? 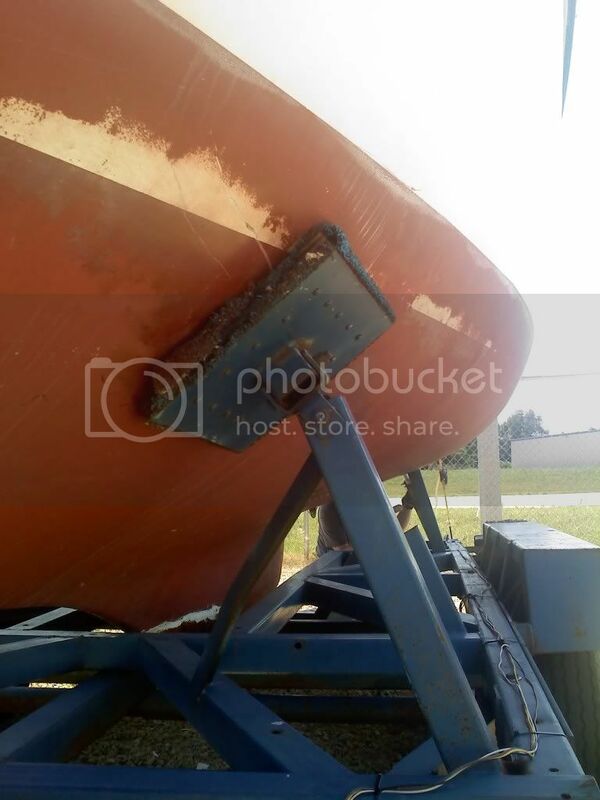 Our swing keel boat needs about 4.5 feet of water to float off the trailer. A bit of redesign could drop that 6"-8" but probably isn't worth the work for me. For a fixed keel boat I think adding 18" would get you in the ballpark, so figure about 5.5' minimum. We launched Copacetic using a 7' tongue extension with the rear wheels of my van almost to the water's edge. So, I think launching your fixed keel boat is possible although not something you'd probably like doing every weekend. You might want a longer extension, but using some of the designs I've seen I think you could go 12 feet or so without any issues. Between that and picking your launch sites carefully it could be done. Remember that when it's way out there, the boat and trailer don't weigh much, so sinking in shouldn't be an issue until you get a bit closer. Having said all that, I bought a swing keel boat on purpose. Given the Rub Goldberg mods we made our trailer we need about 4 feet of water to float our C-22. We use 2 20 foot tow straps looped together. One end looped around the hitch and locked down and the other looped around the vertical part of the trailer where the winch is. Our ramp is quite long and it must be done at the very top of high tide, but the trailer remains on the ramp the whole time. We probably have to drop her at least 30 feet from the back of the tow vehcile. It requires someone, read me, to stand along side the trailer as it is compeletley submereged holding it in line while hubby drivers her on. We have bunks, not stands, which might make a difference. Once the boat is on hubby climbs down over the bow and he walks beside the front of the trailer coaxing the wheel on the front of the trailer to stay in line while I pull her up the ramp. The ramp is quite long and fairly gentle. The high tide runs 7 to almost 9 feet depending on the moon cycle. I have no idea whether this will work for you, but at the very least I would reccomend a few dry runs to see how deep the trailer can go and still stay on the ramp. You may be looking at having the baot lifted and placed on the trailer as a better alternative. Tom, thanks so much for the advice, I will start looking around for a very long deep ramp, my nearest ramp is really for power boats so it is kinda short and shallow and then there is a very steep drop - off, from where the trailers become unretreivable..... I already have a custom made tandem sailboat trailer so it already has low or drop axles. I have a slip so I only would have to do this twice a season, thanks for your very detailed launch procedure, it is very helpful to know exactly how it is done, I think you are right, I will resign myself to using the boat yard to lift off or lift on the boat , and probably also raise lower the mast, --- also SailTrailers told me that the pads on the trailers are more forgiving of placement of the boat than bunks or saddles. I have seen some super long tongue extensions with some large tires on the front..
but first to get it up to NYC from jacksonville.